Looking for a Used Sequoia in your area? CarGurus has 5,729 nationwide Sequoia listings starting at $1,200. 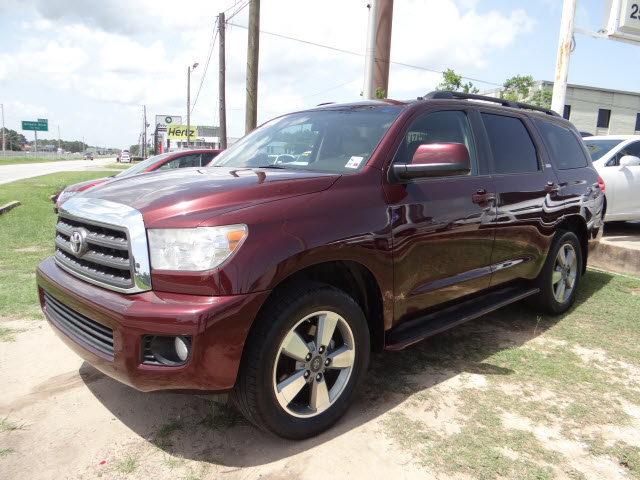 When you absolutely have to get yourself and 7 others there through fair weather or foul, uphill and downstream, in comfort and style, check out the 2014 Toyota Sequoia. Again boasting 3 rows of seating, a boatload of standard features, V8 power and available part-time, multi-mode 4-wheel drive (4WD), this big Toyota still carries Tundra-based body-on-frame construction for rugged dependability while perusing the lower forty or visiting those mountain-dwelling cousins. Oh, and this sizable full-size sport ute also flaunts a cavernous 120.1 cubic feet of cargo space with the rear seatbacks folded, while retaining the capability to tow up to 7,400 pounds of trailer with the standard tow hitch and wiring. Look for this biggest of Toyota’s SUVs to remain delivered in three well-heeled trim levels, the base SR5, the up-featured Limited and the top-shelf Platinum, while this elegant brute’s various editions remain powered by the peppy variable-valve-timed (VVT) 5.7-liter V8 once more managed by a standard 6-speed shiftable automatic transmission. Expect 381 hp and 401 lb-ft of torque from this potent drivetrain, with mileage numbers estimated at 13 mpg city/17 highway in either the standard rear-wheel drive (RWD) or the available 4WD configurations. The optional 4WD system, by the way, offers a 2-speed transfer case, as well as driver-selectable settings to lock in the auto-engaging limited-slip rear differential for more serious traction-challenged situations. Oh, and the V8 is also available in an ethanol-capable Flex Fuel (FFV) version that retains all the power numbers of the standard non-FFV powerplant. Look for the base SR5 trim to return bearing standard 18-inch alloy wheels, a power sunroof, a roof rack, step running boards and heated power-adjustable mirrors outside, with cloth upholstery, a power-adjustable driver’s seat, reclining second-row seats, full power accessories and manually split-folding third-row seats among the standard cabin bling. Cruise control and telescoping tilt-wheel steering, tri-zone climate control, Bluetooth hands-free calling and an Entune-infotainment-interfaced single-CD player flaunting satellite radio and a dashboard-mounted touchscreen round out the more notable standard features. The midlevel 2014 Sequoia Limited, meantime, adds 20-inch alloy wheels, a power liftgate, leather upholstery, heated power-adjustable front seats, power-folding third-row seats, front and rear parking sensors, and Entune apps, along with a standard hard-drive-based navigation suite. As the top-shelf trim, the Platinum loads premium leather seating, a driver-selectable auto-damping suspension system, memory for driver's settings, premium 14-speaker audio with a video monitor, and rear-seat DVD entertainment onto the list of delivered equipment. Again for 2014, look for many of the standard features found in the higher Sequoia trims to be available in lower trims, while upgraded TRD 17-inch off-road-dedicated wheels, remote engine start and second-row captain’s chairs (which limit capacity to 7 passengers) are all slated as optional equipment lineup-wide. Noteworthy safety features, finally, should again include 4-wheel antilock brakes (ABS), traction and stability control, front side-mounted airbags and 3-row head airbags. Further safety features for 2014 are expected to include daytime running lights, front fog/driving lights and a remote antitheft alarm, with the Limited and Platinum editions additionally offering standard turn-signal-integrated mirrors. 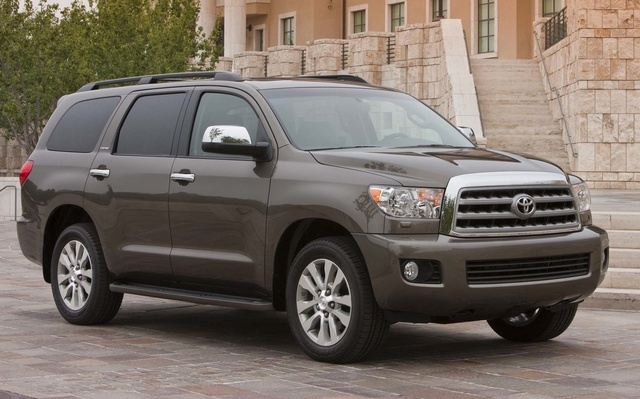 What's your take on the 2014 Toyota Sequoia? Users ranked 2014 Toyota Sequoia against other cars which they drove/owned. Each ranking was based on 9 categories. Here is the summary of top rankings. Have you driven a 2014 Toyota Sequoia?